This is it! The legendary rocket firing Boba Fett figure. This one is known as the "L-Slot" variety in that the slot in it's back is the shape of a backwards "L". This is in contrast to the J-Slot style of RocketFett. Notice that the bluish color of the plastic used on this figure is distinct from the Boba Fett production figure which is more gray. Although there are about two dozen of these unpainted first shot Boba Fetts in existence, less than half of them have the original rockets. Many collectors complete their figures with reproduction missiles that are only slightly different in color from the originals. The rockets that accompany this style of figure have 4 ribs rather than 8 ribs which are present on the production Boba Fett. The back side of the rocket firing Boba Fett is the more interesting side. Notice that there's no date stamped on the leg. The detail comes out well in this photograph and you can see that there are only a few coils in the spring. 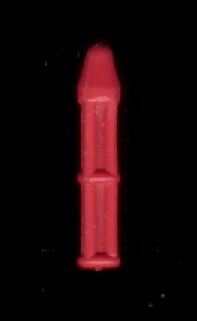 Many of the reproduction versions of this figure have several coils and stiffer springs leading to quite a powerful rocket mechanism. The real RocketFett doesn't actually shoot much more than 24 vertical inches. According to popular belief, the cancellation of the rocket-firing feature was prompted by a death that was caused by a missile launched from a Battlestar Galactica toy. Information about this death and the resulting chaos can be found here. What else is there to say about this piece...there is no Star Wars prototype more well-known than the rocket firing Boba Fett figure. Contrary to popular myth, these figures were never shipped to kids via the popular mail-in offer, despite how relatively common it is to meet collectors who swear they received one from Kenner.